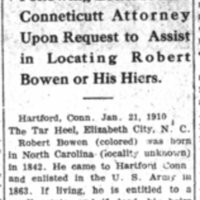 Bowen, born in North Carolina, went to Hartford, Connecticut, and enlisted in the U.S. Army in 1863, during the Civil War. Bowen, or his heirs, are entitled to a "small estate." 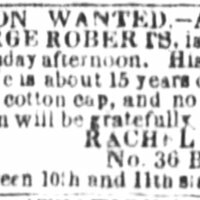 Hiram left Montpelier, Vermont, nearly 20 years ago [ca 1823]. 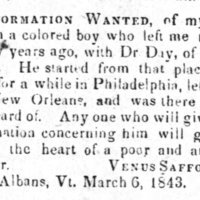 He was in New Orleans when last heard of. 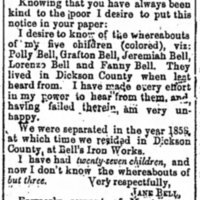 His mother placed this antebellum ad in 1843. 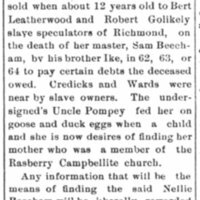 Hampton was sold away from her mother, in Richmond, Virginia, during the Civil War. 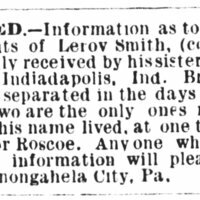 His parents were in Beatville, Mississippi [Batesville? ], when last heard from. 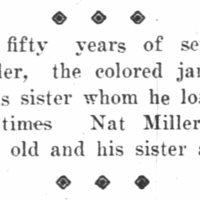 Nat Miller/Nate Miller/Nathan Miller, of Lawrence, Kansas, lost his sister "during slavery times." 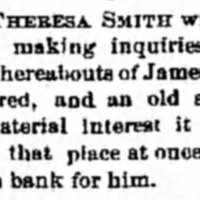 He found her in 1904. 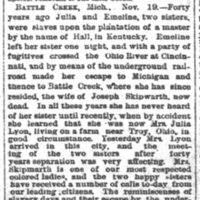 Emeline Skipwarth escaped from slavery in Kentucky to Michigan. 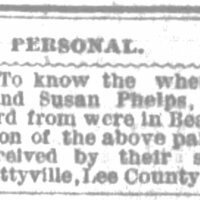 Forty years later, in 1885, she found her sister, Julia Lyon, near Troy, Ohio.